Fujifilm will next month launch a new and improved 3D camera called the FinePix Real 3D W3, boasting 3D High Definition (HD) movie functionality. 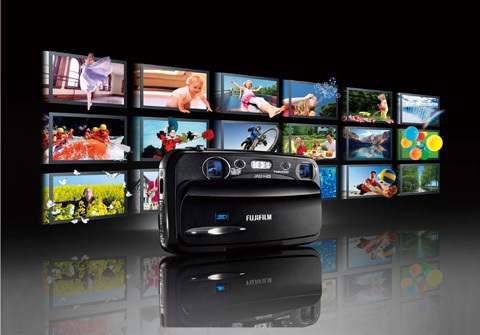 Billed as smaller and lighter than the original model, the FinePix W3 adds a larger 3.5in monitor, stereo sound recording and the ability to view 3D images (live or recorded) on compatible televisions using special glasses that come with the kit. As with the previous model, images can also be viewed in 3D on the camera?s screen, without special glasses. The W3 is a 10-million pixel camera sporting two, 3x optical zoom lenses (35-105mm viewing angle equivalent). The W3 is due out early next month priced £399. Macro(3D)：Wide: Approx. 38cm -70cm / 1.2ft -2.3 ft.
Telephoto: Approx.1.1m – 2.3m /3.6ft. -7.5ft. Macro (2D : Wide: Approx. 8cm – 80cm / 0.3ft. – 2.6ft. Telephoto: Approx. 60cm – 3m / 2.0ft. – 9.8ft. Macro：［Wide］ Approx. 48cm～70cm / 1.6ft -2.3 ft.
［Telephoto] Approx 1.4m～2.2m / 4.6ft. -7.2ft. Shutter speed Night: 1/8sec. – 1/500sec. Night (Tripod): 3sec. – 1/500sec. Wide: Approx. 60cm – 3.6m / 2ft. – 11.8 ft. Telephoto: Approx. 60cm – 3.1m / 2ft. – 10.2ft. Wide Approx. 30cm – 80cm / 1ft. – 2.6ft. Telephoto: Approx. 60cm – 1.5m / 2ft. – 4.9ft. Dimensions Approx. 124.0 (W) x 65.9(H) x 27.8 (D) mm / 4.9 (W) x 2.6 (H) x 1.1 (D) in.